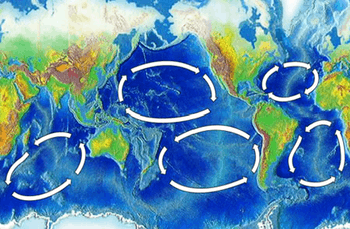 There are trash vortices in each of the five major oceanic gyres. The Indian Ocean garbage patch, discovered in 2010, is a gyre of marine litter suspended in the upper water column of the central Indian Ocean, specifically the Indian Ocean Gyre, one of the five major oceanic gyres. The patch does not appear as a continuous debris field. As with other patches in each of the five oceanic gyres, the plastics in it break down to ever smaller particles, and to constituent polymers. As with the other patches, the field constitutes an elevated level of pelagic plastics, chemical sludge, and other debris; primarily particles that are invisible to the naked eye. A similar patch of floating plastic debris in the Pacific Ocean, the Great Pacific garbage patch, was predicted in 1985, and discovered in 1997 by Charles J. Moore as he passed through the North Pacific Gyre on his return from the Transpacific Yacht Race. The North Atlantic garbage patch was discovered in 2010. The existence of the Great Pacific garbage patch, the first to be discovered, was predicted in a 1988 paper published by the National Oceanic and Atmospheric Administration (NOAA) of the United States. The prediction was based on results obtained by several Alaska-based researchers between 1985 and 1988 that measured neustonic plastic in the North Pacific Ocean. Research studying trash washed onto beaches in and around the Indian Ocean suggested that there would be plastics found in the water column in the Indian Ocean as well. 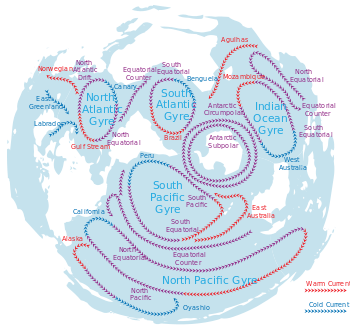 In 2010, the 5 Gyres Project set off on the first of its planned series of transoceanic voyages to determine whether the South Atlantic, South Pacific, and Indian Ocean gyres were affected in the same way as the North Pacific and North Atlantic gyres. On the Indian Ocean leg of their trip, they travelled between Perth, Australia, and Port Louis, Mauritius (east of Madagascar); each of the water samples they collected in the 4,800 km (3,000 mi) between contained plastic. They found that the South Atlantic, South Pacific, and Indian Ocean gyres were affected in the same way as the North Pacific and North Atlantic gyres. Anna Cummins, cofounder of 5 Gyres Institute called the pollution they found "a thin plastic soup". On April 11, 2013, in order to create awareness, artist Maria Cristina Finucci founded The garbage patch state at UNESCO –Paris in front of Director General Irina Bokova, the first of a series of events under the patronage of UNESCO and of Italian Ministry of the Environment. ↑ Moore, Charles (November 2003). "Across the Pacific Ocean, plastics, plastics, everywhere". Natural History Magazine. ↑ "Archived copy". Archived from the original on 14 February 2011. Retrieved 7 January 2011. ↑ Day, Robert H.; Shaw, David G.; Ignell, Steven E. (April 1988). "Quantitative distribution and characteristics of neustonic plastic in the North Pacific Ocean. Final Report to US Department of Commerce, National Marine Fisheries Service, Auke Bay Laboratory. Auke Bay, AK" (PDF). pp. 247–266. ↑ id_articolo=2073 Archived 14 July 2014 at the Wayback Machine. photographer Chris Jordan, who recently traveled to a remote part of the Pacific Ocean to document effects of the world’s largest known mass of garbage. in Seed Boustead, Greg (18 February 2010). "§ Appetite for Destruction". Seedmagazine.com. Retrieved 28 July 2010.